Tonight, the piece de resistance of our lodgings so far – Borthwick Castle. Built in 1430! We are staying in the topmost room – 110 feet above ground via circular staircase. 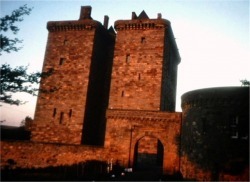 The castle saw two notable events – Mary Queen of Scots and her third husband (Borthwick) were surrounded here and spent their last time together. Mary escaped past the surrounding forces by climbing out the window dressed as a pageboy, but was caught later (1567). Then in 1650 during England’s civil war Oliver Cromwell besieged the place and bombarded it with cannon before the Borthwick family surrendered. Cromwell’s letter offering surrender terms is on display downstairs! Today we awoke to a breakfast alone at the Nunnery. Then we took the “Nunnery Walks” behind the inn, which took us to the River Eden and up a tributary with magnificent waterfalls through a gorge. Wordsworth wrote a poem about the gorge. We went on a “forbidden” path that was roped off, but obviously well-trodden, through the lowest part of the gorge. Beautiful! Then up to Hadrian’s wall. Eighty miles long, what’s left of it. Saw several sections and an ongoing archeological dig at Birdoswald. Then stopped at a park information center where a woman recommended the Steel Rigg section of the wall (which we could walk on) followed by a route to the north through Northumberland. Drove through magnificent scenery to Bamburg Castle, which was impressive from the outside, but not on the inside – filled with “Do Not Touch” signs. It seems that the resident family just wants your money. Then called this place, and they had a room free. So we drove up through more great scenery and are now 12 miles from Edinburgh. Had an ok but very expensive dinner with 4 other Americans at a common table. My woodland pigeon appetizer had a shotgun pellet in it! 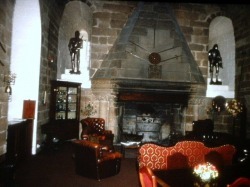 After dinner, we had drinks and coffee in front of a hearth that could sleep 6 comfortably. The dining / common room has a 45 foot ceiling and a minstrel gallery. I was imagining it as the scene of many medieval banquets; I’m sure it was, in reality. Weather still great – sunny / partly cloudy and 60 degrees. I forgot to mention that the camera fixed itself in Wales 12 hours after it broke. Ate dinner with fellow Americans who are scared to drive! I feel like a pro. From listening to them, I feel as if we have seen much more of the country than they have. 81 steps up a spiral staircase to our room in the tower from the main floor (pant).